Over the past to fifty years, there are many artists in Britain and America who could’ve and should’ve enjoyed long and successful careers. Some of these artists even recorded albums that should’ve launched or kickstarted their solo careers . Sadly, the fickle finger of fate decided otherwise and commercial success eluded them. That was the case with British singer-songwriter Gordon Jackson. Despite being hugely talented, Gordon Jackson only ever released one album his lost classic Thinking Back, which is often referred to as a: “lost Traffic album.” However, that isn’t strictly true, despite Dave Mason, Jim Capaldi, Chris Wood and Steve Winwood all playing on Thinking Back which should’ve launched Gordon Jackson’s solo career in 1969. By then, he was an experienced musicians. The story began in the spa town of Worcester, England, in 1963. That was when drummer and vocalist Jim Capaldi, who previously had been a member of The Sapphires, joined forces with guitarists Gordon Jackson from Unit Five and Dave Mason who had been a member of The Jaguars formed The Hellions. However, the nascent lineup of The Hellions was still looking for a bassist and during the first few months various bassists joined and left the band. Eventually, The Hellions were introduced to bassist Dave Meredith, who previously, had been a member of The Cherokees. Now a four piece band, The Sapphires were soon a popular draw in the Worcester area and regularly played at the Flamingo Coffee Bar. However, this was just the start for The Hellions. Over the next few months, The Hellions discovered just how gruelling the life of a professional musician was in West Germany. This is something that The Beatles had discovered, and the gruelling schedule helped them to improve as a band. It was a similar case with The Hellions, and another band they met in Hamburg. This was The Spencer Davis Group, who became friendly with The Hellions. Especially The Spencer Davis Group vocalist Steve Winwood, who quickly discovered that he had much in common with Jim Capaldi and Dave Mason. The friendship that was formed in Hamburg would blossom when the two groups returned home. After returning home, The Hellions were a much tighter band and were soon backing some of the big names who visited the Midlands, including Adam Faith and Dave Berry. However, by the end of 1964, The Hellions were ready to leave the Midlands after securing a residency at the Whisky-A-Go-Go Club in London. This brought The Hellions to the attention of the American record producer Kim Fowley and songwriter Jackie De Shannon, who helped the band secure a recording contract with Pye. In 1964, The Hellions released their debut single Daydreaming Of You on the Pye imprint Piccadilly. It was penned by Jackie De Shannon, and produced by Kim Fowley, but sadly, the single failed to trouble the charts. History repeated itself when The Hellions released Tomorrow Never Comes and A Little Lovin’ in 1965. Despite their lack of commercial success, The Hellions were asked to open for American vocalist PJ Proby when he toured Britain. This The Hellions hoped would introduce their music to a new and wider audience. However, still The Hellions struggled to make a commercial breakthrough. Although the band was still to enjoy its first hit single, The Hellions added flautist and vibraphonist John “Poli” Palmer to their lineup. However, he switched to drums, which allowed Jim Capaldi to take charge of the lead vocals.Alas, this change in The Hellions didn’t result in a change in fortune for the group. By 1966, The Hellions were struggling financially, and the expenses were mounting with each passing week. They had no option but to return to Worcester where they had started out three years earlier. However, the music scene was very different in Worcester by 1966, and things weren’t looking good for The Hellions. As a last roll of the disc, The Hellions released one more single in 1966. This was Hallelujah, which was credited to The Revolution, but sank without trace. It was the end of the road for one of The Hellions. Guitarist Dave Mason left The Hellions and played with various local groups, and worked as a roadie for The Spencer Davis Group. Meanwhile, Jim Capaldi brought guitarist Luther Grosvenor who had been a member of The Wavelength onboard and renamed The Hellions as Deep Feeling. The newly named Deep Feeling started playing in and around Birmingham, and became known for a heavier, psychedelic-tinged type of music. This they wrote themselves, and when they played live, every band member sang. When John “Poli” Palmer switched to flute or vibes, Gordon Jackson played drums. Deep Feeling was a cut above most of the bands on the Birmingham scene, and surely it was just a mater of time before they were discovered? It was The Yardbirds manager and producer Giorgio Gomelsky that expressed an interest in Deep Feeling after seeing them play live in Cheltenham. Not long after that, Giorgio Gomelsky arranged for Deep Feeling to record their debut album. However, although the band recorded several songs, only the Jim Capaldi, Gordon Jackson and John “Poli” Palmer composition Pretty Colours was released as a single, but only in France. Meanwhile, Deep Feeling started to travelling to London on a regular basis, and that was where they met The Animals’ manager Chas Chandler. He asked if a young, unknown American guitarist called Jimi Hendrix could join them on stage. Deep Feeling agreed and that night, three became four. Little did anyone realise that Jimi Hendrix who made his debut on a British stage with Deep Feeling would go on to become a legendary musician. Around this time, the former Hellions guitarist Dave Mason was still drifting between bands and working as road manager for The Spencer Davis Group, who sometimes, played at The Elbow Room in Birmingham. That was there where Jim Capaldi and Dave Mason from Deep Feeling and Steve Winwood from The Spencer Davis Group would sometimes join forces with saxophonist and flautist Chris Wood who previously had been a member of Chicken Shack, and was now a member of Locomotive. However, what started out as a jam session ended up in the formation of a new band. In early 1967,Steve Winwood announced that he was leaving The Spencer Davis Group and was about to form Traffic with Jim Capaldi, Dave Mason, and Chris Wood. This was a huge shock to the remaining members of Deep Feeling, who after careful consideration, decided to call time on the band and embark upon other musical projects. After the demise of Deep Feeling, Gordon Jackson and John “Poli” Palmer continued to write songs together, and it looked like they had established a successful songwriting partnership. However, this changed when Georgio Gomelsky offered Gordon Jackson a recording contract with his label Marmalade Records. Georgio Gomelsky had formed Marmalade Records in 1966, and since then, it became home to the many artists that he managed. 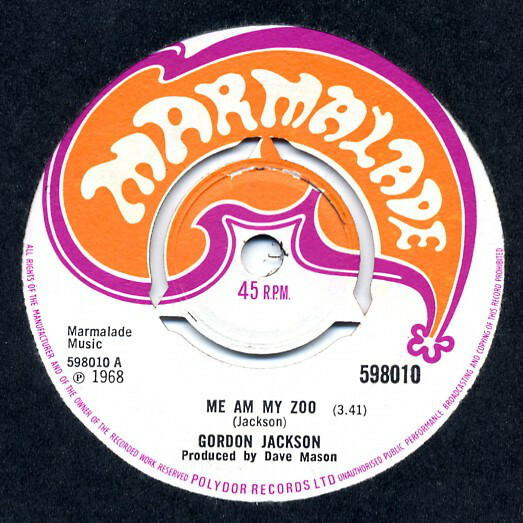 Marmalade Records which was distributed by Polydor Records, was about to become to Gordon Jackson when he signed his recording contract, and embarked upon a solo career. Having signed the recording contract, Gordon Jackson was soon working on his debut solo single. He wrote two new songs, Me Am My Zoo which became the single and the B-Side A Day At The Cottage on the B-Side. Both sides were produced by Dave Mason and featured the first lineup complete of Traffic. Sadly, Me Am My Zoo failed to find an audience upon its release in May 1968 and didn’t even come close to troubling the British singles’ charts. Despite that, Georgio Gomelsky encouraged Gordon Jackson to continue writing his debut album Thinking Back. He eventually had written seven new songs which were recorded in late 1968. Just like the recording of his debut single,Dave Mason took charge of production on Thinking Back and brought onboard Traffic who became Gordon Jackson’s backing band. They were augmented by some top musicians. Joining the members of Traffic were Gordon Jackson’s old friend and former songwriting partner, organist and pianist John “Poli” Palmer. He was joined by bassist Rick Grech, soprano saxophonist Jim King, conga player Rocki Dzidzornu and Remic Abacca played tabla, while Chicken Shack’s Rob Blunt switched between acoustic guitar, electric guitar and electric sitar. Adding backing vocalists Julie Driscoll, Spooky Tooth’s Luther Grosvenor and Reg King, Rob Blunt switched between acoustic guitar, electric guitar and electric sitar. Gordon Jackson played acoustic and rhythm guitar and laid down the vocals on Thinking Back. Once the album was complete, Thinking Back was scheduled for release on 1969. Before the release of Thinking Back, which had the potential to launch Gordon Jackson’s solo career, and could’ve been a profitable release for Georgio Gomelsky’s Marmalade Records the record label failed to promote the album properly. This must have been hugely disappointing for Gordon Jackson given the quality of music on Thinking Back. When Thinking Back was released by Marmalade Records in July 1969, and was a groundbreaking and melodic fusion of folk, pop, psychedelia, rock, soul, world music and a myriad of Eastern sounds. The supergroup that played the complex music on Thinking Back were tight and versatile, on the seven songs that feature on Thinking Back. This includes the album opener The Journey which sounds as if belongs on Traffic’s Mr. Fantasy album, until Gordon Jackson delivers his inimitable vocal on this genre-melting track. It’s a memorable and melodic fusion of drama and Eastern sounds which features elements of folk, pop and psychedelia. The tempo drops on My Ship, My Star, which is a slow, beautiful and haunting track with a spartan arrangement where just an acoustic guitar and piano accompany Gordon Jackson’s melancholy vocal. Me and My Dog originally started life as Me Am My Dog when it was released as a single, but by the time Thinking Back was released, this catchy, melodic track had taken on a new lease of life. Despite the lyrics lacking the depth of the other tracks on Thinking Back, the song still leaves a lasting memory. Very different is Song For Freedom along, where the rhythm section drive the arrangement along as horns, percussion and backing vocalists accompany Gordon Jackson on this lost dancefloor friendly sixties anthem. Sing To Me Woman which was released as a single, but failed to chart is an out-and-out rocker that could’ve given Gordon Jackson that elusive hit single. He’s accompanied by cooing harmonies as he delivers lyrics that are rich in imagery. The seven minute epic When You Are Small is atmospheric and full of Eastern sounds as a jazzy saxophone plays, while Gordon Jackson thinks back to his youth. Closing Thinking Back is Snakes And Ladder which, has a progressive arrangement and as Gordon Jackson’s heartfelt vocal delivers lyrics that are almost surreal on this complex and carefully crafted track. It ensures that Thinking Back which is a lost classic closes on a high. 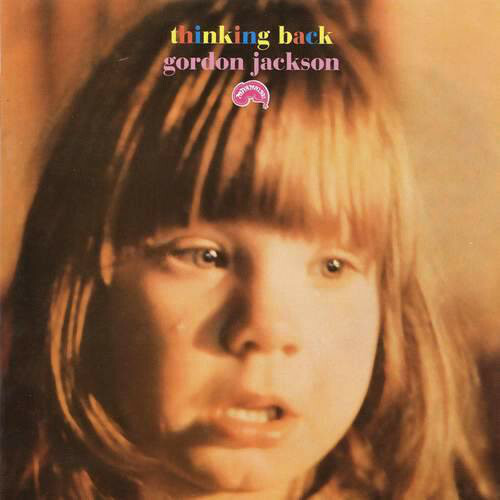 For Gordon Jackson, his debut album Thinking Back was the one that got away. It featured seven songs that were variously beautiful, haunting, lysergic and ruminative. So much so, that some of the songs on Thinking Back encourage reflection. These songs are part of an album that should’ve launched Gordon Jackson’s solo career. Sadly, when Thinking Back was released, Marmalade Records were experiencing distribution problems, which wasn’t a good sign for Gordon Jackson. 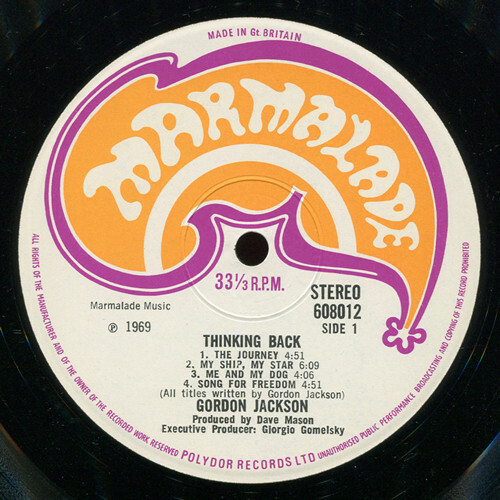 Then after Marmalade Records had pressed around 2,000 copies of Thinking Back, the label collapsed. 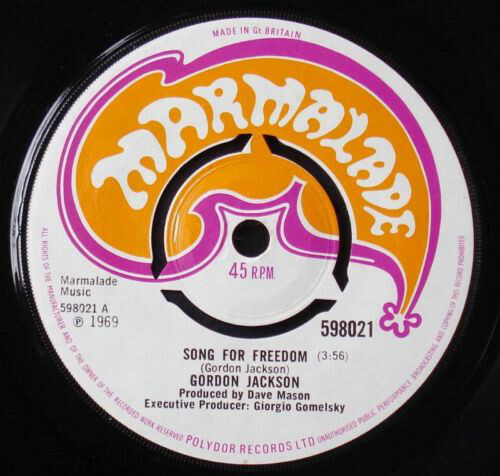 With Marmalade Records insolvent, this was a huge blow for Gordon Jackson who many critics felt had a big future ahead of him. While Gordon Jackson continued to play live over the next few years, he never returned to the studio and only ever recorded one single and one album. That album, Thinking Back should’ve been the start of a long and successful career for this talented singer, songwriter and musician. Sadly, Thinking Back was Gordon Jackson’s one and only album, and after the demise of Marmalade Records he spent several years playing live, before turning his back on music and embarking upon a career restoring churches. Music’s loss was liturgical restoration’s gain and Gordon Jackson never released a followup to his lost classic Thinking Back. ← DR JOHN-THE ATCO YEARS 1968-1974.